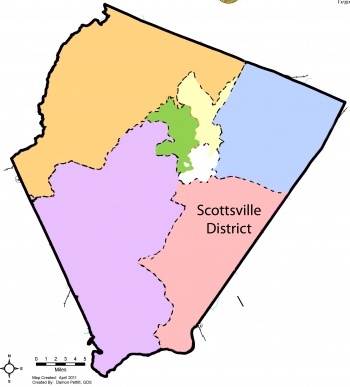 The Scottsville Magisterial District is one of six magisterial districts in Albemarle County. It is named for and located around the town of Scottsville. Rick Randolph is the member of the Board of Supervisors. Pam Riley is the planning commissioner. Steve Koleszar is the Albemarle County School Board representative. This page was last edited on 18 November 2018, at 23:58.